Answer: Houseplants and flowers can add warmth to your home by bringing the outdoor garden inside. Just a few plants or flowers used as decorating elements can transform a room and give a finished look. You’re correct, if you look at home decorating catalogs or visit a showroom you’ll find many decorating ideas, which include plants and everything from decorating a home office to an overall interior theme. However, most pictures in the home design catalogs use plants and flowers to compliment the furniture from a decorating vantage point — not "advising" on what plants fit in what setting. Look around when you’re out visiting an office building, mall or a hotel. You’ll notice interior plantscaping integrated into the overall design package. Houseplants and flowers in your home let you express and reflect your personality while bringing a room to life. Using live plants is a natural solution. For example, decorating a home office can come down to simply placing a blooming Bromeliad in an attractive container to add an interesting new element to a space and create immediate impact. A note on selecting containers; choose pots, planters and containers that compliment your style both in lifestyle but also house style. Experiment with ideas — a Mexican style home lends itself to terra cotta containers for decorating as an example. Selecting houseplants or flowers to use in homes and garden decorating scheme needs to include any maintenance the plants require. The flowers and house plants used in the home decorating catalogs are only there for the picture. You need to know of any special care required, like watering, fertilizing, pruning, and specific plant lighting needs. If you’re new or lack experience in plant care start off with varieties which tend to fall into the "easy to care for" category. The ZZ plant, Aspidistra — cast-iron plant, Aglaonema and some varieties of palms do well with moderate light. Try ferns in cool areas like basements, they do well, plus you’ll find lots of new fern varieties on the market! For flowering plants my top picks — orchids and bromeliads, their flowers can last for months. 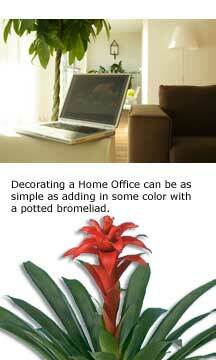 Decorating with Bromeliads offers a nice plus. Many of the Guzmania varieties will give 90-120 days of color, replacing them can be as easy as popping out the plant in the decorative pot and replacing with a new plant. A single Phalaenopsis orchid makes a statement of simplicity ad elegance. Over the past few years the price keeps dropping and selection continues to grow. If the cut flower or fresh flower route works better for your decorating style try to maximize the flowers longevity by changing the water daily and removing and old stems of flowers. Houseplants and flowers give you a quick fix and unlimited possibilities in any homes and garden decorating project. Look at what plants add to change the look of a room when compared to art or furniture. It’s a simple and inexpensive home decorating improvement — but don’t go by the plants shown in the home decorating catalogs.